Catalan economist Vicenç Navarro delivers view points whose argument sounds completely contrarian at this stage. While austerity may be debated over –at which degree should it be imposed and how quickly, so further spikes in sovereign debt can be avoided?–, the consensus bears little doubt: public investment must be dramatically lowered. It is the right medicine. But confronted with an increasingly stalled productivity and a disquieting unemployment rate, those of Spain, Navarro will not join the majority that recommend public budget cuts. Fiscal retrenchment, whether Spartan or progressively introduced, fills the recipe for states to free themselves from the bond markets and assure investors that outstanding borrowing will be repaid. Once waste has been reduced to the minimum and competitiveness regained, once capital inflows come back and confidence is recovered, the economy would relaunch. Not so, said Navarro in an article published Monday. In fact, the trigger of the disheartening number of Spaniards who have been left jobless since 2007 is the anemic size of the public sector. “The conventional wisdom’s interpretation given to explain Spain’s unemployment is that the Spanish labour market is too rigid. It is constantly repeated by the neo-liberal media that unions have been protecting permanent contracts, which include workers who already have a job at the expense of those without job and who can not find one. Navarro accuses this plot for deliberately ignoring that the number of existing jobs remains constant, and the elimination of permanent contracts will only vary the composition of the workforce. Lower wages will be the consequence, too, although this rather is the goal, Navarro’s critics would say: burdened with less costs, companies will raise their production and hiring will ensue. In any case, there is this link Navarro traces between public sector size and jobs that we found amusing: the public sector payroll in Spain is sis percentage points below the EU-15 average, and 16 below when compared to Sweden. “Data show that Spain has one of the highest unemployment, not only the EU-15, but also in the OECD. Labour reforms […] are not touching the core problem: the lack of job creation. If you look at the numbers you will see that Spain is the country that has fewer jobs per 1,000 population of the EU-15 (396), together with Greece (373) and Italy (380). 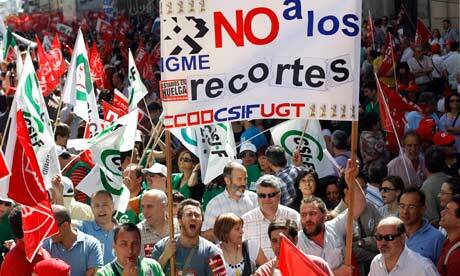 Be the first to comment on "Don’t blame Spain’s public sector payroll: it’s 6pc smaller than the EU average"